First, pretzel buns were all the rage. Is pretzel pizza crust next? Little Caesars started testing Pretzel Crust Pizzas around this time last year and it is, apparently, still available at a select number of locations. The pizza features a crust of pretzel dough with a sprinkling of pretzel salt and an extra bit of shredded cheese on top. The price is $6 for a large pretzel crust pepperoni pizza (which is $1 more than their regular Hot-N-Ready large pepperoni pizza). Since locations offering it already have the dough handy, they're also offering pretzel bites, like you'd find at Auntie Anne's and Wetzel's Pretzels, with cheese sauce for dipping. 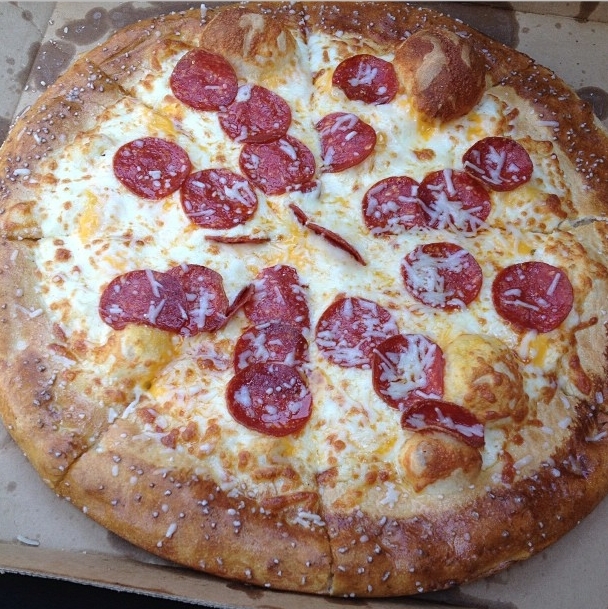 Let me know if you've spotted Little Caesars Pretzel Crust Pizzas at your local store and I'll update accordingly. Thanks!